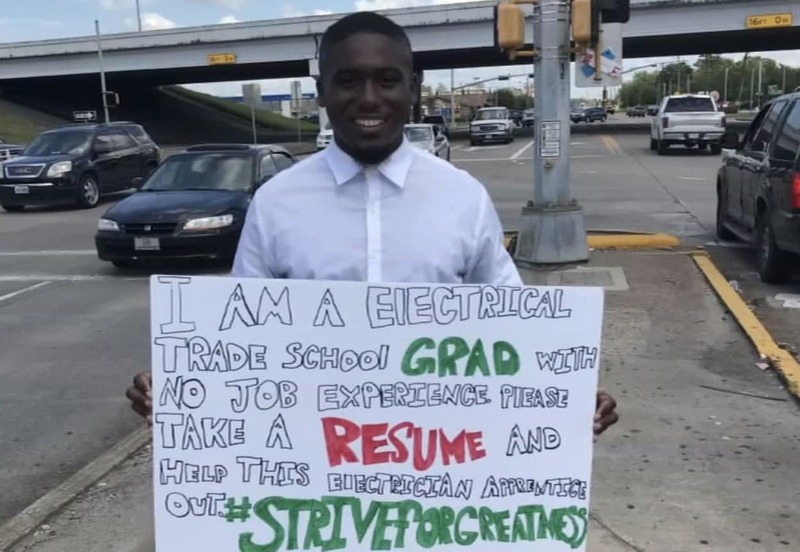 An unemployed trade school graduate in Texas who went viral for standing at a busy interaction passing out résumés and holding a sign with the hashtag #StriveForGreatness has finally landed a full-time job! After his grandmother passed away last week, Matthews decided to try a different approach to snag a job. Inspired by a local news story about a homeless man who stood on the street holding a sign that read “Hungry for Success” and passing out his résumé. That’s when he decided to do the same thing. During the two-hour outing, Matthews handed out five résumés (and was gifted some water and a bottle of Sprite from trucker who spotted him standing in the scorching heat), but when the weather became unbearably hot, he headed home. The second driver to take Matthews’s résumé ended up being a woman from Houston whose father’s electrical service company had a job opening, so she offered Matthews an interview. On Tuesday, he met with company personnel and was hired on the spot. THANK YOU GUYS SOO MUCH. I have a job now! I can’t believe it, my dreams are finally coming true after all the failures! I’m truly blessed to be in this amazing city. Houston is where amazing happens!